Vince Navy And Gray Striped Cashmere Sweater Size XS. Condition is Pre-owned. Shipped with USPS. Beautiful sweater! So incredibly soft and cozy. Please look to pictures for signs of condition. Let me know if you have any questions and happy buying! These sweaters were a thing a few years ago. Sleeve Length: 24". Total Length: 21". Very light wear. If an item were in excellent condition with an easily replaceable button then it would be graded as a FAIR. Enjoy an effortless look with each wear. Striped pattern. Size: Small. Cardigan Coat Sweater. Great Charcoal color with Black trim. Charcoal with Black Accents. Listed as Size S. Could serve manysizes. Vince Sweater Size Large. Condition is Pre-owned. Shipped with USPS Priority Mail. Vince Wool Cardigan With Leather Trim. Condition is Pre-owned. Shipped with USPS Priority Mail. Off-white cream color with black leather trim. Hits mid thigh. VINCE cotton sweater / long sleeve tee S, boat neck, long sleeve, light pink, very good condition. Condition is Pre-owned. Shipped with USPS Priority Mail. Tunic Sweater Boatneck with Drop Shoulder. Fabric Care: Hand wash. plastic bag after being photographed for storage. I normally respond within 24 hours or less. Location: Bin# 1. However, as seen in the pictures, it still looks nice! See pictures for all of the details. It looks SO CUTE in person! It has pockets too! No Reserve. We have received over. Sleeve Length: 16". Total Length: 23". 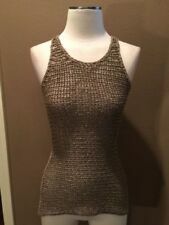 Vince Beige Knit Blend V-Neck Sweater Size L. Condition is Pre-owned with little wear. Heavy knit weave that breathes, perfect for cool summer nights. V-Neck in front and back, with slightly belled sleeves. Hits below hip. I wore it all the time with white jeans for an easy polished summer look. Shipped with USPS Priority Mail. DESCRIPTION: VINCE Button sleeve funnel neck Pullover sweater. Size S. 90% wool 10% Cashmere. New without tags. Thanks! *all my items comes directly from Nordstrom Comes from clean, smoke free home. I provide measurements on most of my items, I cannot physically measure each and every one though, so if you need measurements please let me know. I strive for positive ratings and I am willing to work with my buyers so please, again don't hesitate to contact me for any questions. Will ship within 1 day of auction closing and after payment has been cleared. I do accept returns and will refund full amount minus shipping fees(I DON'T REFUND ORIGINAL SHIPPING FEES) also buyer will pay return shipping. Gray with white stripes. Fitted style. Cotton/Nylon Blend. Ribbed at sleeve and hem cuffs. Womens Black Vince Sweater Size Large. Condition is Pre-owned. Shipped with USPS Priority Mail. Ladder stitched trim. 28" length; 23" across Bust, armpit to armpit. Hand wash cold. Maybe worn twice.Shows tiny bit of Pilling.No Signs of major wear, no holes, no flaws! Great Condition, lots of life left in this Beauty! For sale is a boiled wool open cardigan by VINCE. It is size XS and is pre-owned. SLEEVE LENGTH: 26". Round hem, angled. Item condition/notes: Very nice condition, soft, lightweight. Beige shade. bust across 19". Wool Blend. Sleeve Length: 16". Total Length: 27". If an item were in excellent condition with an easily replaceable button then it would be graded as a FAIR. VERY GOOD–. Vince colorblock sweater blue and black. See close up photo for true color - the other photo is a bit washed out. 100% cotton. Condition is Pre-owned. Shipped with USPS Priority Mail. This item is in excellent condition. Armpit to Armpit: 23". Vince Tan Open Front Short Sleeve Sweater W/ Hood Size XS. Two small holes on back of sleeve. Otherwise in great condition. Condition is Pre-owned. Shipped with USPS Priority Mail. 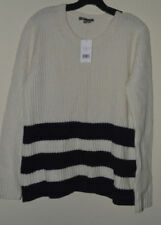 VINCE Black/White Chenille Sweater Sz Small. Condition is Pre-owned and almost like new - very little wear. Very cute pullover style side slits. Measures 24 chest and 26 long. Definately for Spring! Vince Black Linen Sweater Long Sleeve Top, Sz M. Condition is Pre-owned. Sweater is in good preowned condition. Solid navy blue. Hits at the top of the waist. Style: Loose, 3/4 sleeve, v-neck, front shorter. Color: light pink. Length front 25.5" back 27". THIS SWEATER FEATURES A LAYERED LOOK WITH SILK UNDERLAY AND A HI-LO HEM. Vince Short Sleeve Grey Sweater XS. Shipped with USPS Priority Mail. Vince Ombre Sweater Large. Condition is Excellent. Worn once. Ships from New York. Great with cream jeans for spring. Shipped with USPS Priority Mail. Length from the shoulder 26.5”(front) 28”( back). Other than that it’s in excellent condition. Sleeve length 24”. Armpit to armpit 24”. Vince Sweater Pullover, Beige Ribbed Chunky Knit, 50% Yak, 50% Wool, Very Soft, Slightly Mock neck. Button front, two pockets, draped batwing short sleeves. Shows wash wear including fuzzing. Otherwise in good pre-owned condition. Bust: approx 40". 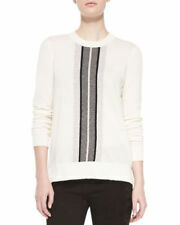 Vince sweaters for women come in a wide array of colors that include blue, black, white, red, ivory, and green. They also come in many different sizes for women that can be divided into four distinct categories of regular, petite, plus, and junior sizes. Which styles are Vince sweaters available in? Cardigan: This is a type of sweater that is knitted and is fastened down the front. It is typically thin in nature and comes with long sleeves. While this type of outerwear is primarily designed to be left open with a shirt underneath, there are usually buttons down the front. Pullover: A pullover is a type of thin sweater, usually with long sleeves, that is put on by taking it over the head. It usually extends down to around the waist. Turtleneck: This is a type of garment where the neck of the sweater extends to the upper portion of the neck and is turned over. It is also usually close-fitting. V-neck: This is a specific type of sweater wherein the neck of the garment forms a V with two straight lines that meet at a specific point. They are usually designed to be worn over dress shirts or similar pieces of clothing. Crewneck: This is a type of design where the neck of the sweater is close-fitting and is rounded without any type of collar. What are the different patterns that Vince sweaters come in? Vince sweaters come in an array of different patterns that include floral and geometric patterns. Some of the common patterns with these pieces of clothing include solid, striped, plaid, and textured. It is also possible to find sweaters with such patterns as Nordic, animal, shiny, and polka dot. Which materials are these sweaters made from? Cashmere: This is a type of wool that is comprised of thin and wispy threads and is obtained from certain species of goats. Before being used in the creation of sweaters, the hair is removed from the wool and spun into fibers. Cotton: This is a white substance with a fibrous nature that is situated around the seeds of certain subtropical and tropical plants. There are several different types of cotton, which is largely determined by the location that the cotton was taken from. It is sometimes blended with other natural and synthetic fibers to create distinct blends with qualities from each fiber. 100% wool: This is a thin, wavy, or curly hair that is taken from the coat of a goat or sheep. This substance is primarily comprised of protein and can be made into yarn before being used in sweaters. Merino wool: This is a type of wool that is taken directly from the Merino sheep species, which are primarily found in Australia. Lace: This is a type of material that is made through the knitting, looping, or twisting of other fabrics such as silk or cotton into different patterns. Content provided for informational purposes only. eBay is not affiliated with or endorsed by Vince.